Here are my initial thoughts on the email question: The R hemi-diaphragm doesn’t need help in its respiratory role. It already has plenty of help in the form of a liver below, larger, thicker crura and central tendon, and better abdominal opposition to maintain its domed positon. Its dominant respiratory activity contributes to chronic tension, not only of the abdominals, intercostals, and lats on the R side, but also of the muscles associated with the R brachial chain. This is the crux of the reduced R intercostal and apical expansion. So can activation of a R psoas change this, and can it improve R apical expansion? Yes, indirectly, with a host of other muscles, but not by “activating a right diaphragm”. In our conversation about this email, Ron reminded me that occasionally a R psoas, not just a L psoas, can get hypertonic in a L AIC pattern. How? Our brain simply wants fulfillment of L spinal rotation, and these 2 muscles may work together in an attempt in to satisfy the brain’s “request”. How is it that the R psoas and L diaphragm (and L psoas and R diaphragm) work harmoniously, if not through “tightly woven attachments”, as is the case ipsilaterally? A vector force, through fascial connections overlying the anterior vertebral bodies, creates this contralateral influence. Is this right psoas-left leaflet connection in the transverse plane significant? No, they are ineffectual in achieving L lower spinal rotation. Why? Because of the L side’s hyperinflated state and externally rotated ribs. There is air in the way! 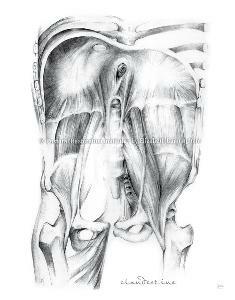 Could a right psoas assist a L diaphragm with drawing air into the R apical chamber? Indirectly, yes, along with a host of other muscles. However, certain conditions must first be met. The R diaphragm partners with its abdominal wall to maintain its position as a powerful muscle of respiration and rib orientation. If the R psoas becomes busy trying to rotate the lower spine to the L with a L hemi-diaphragm that has a smaller, shallower crura and with L ribs that are in ER, it will need L IOs/TAs to provide the needed pull on the L lower ribs for thoracic flexion and doming of the diaphragm. Additionally, L abdominal wall opposition creates intra-abdominal pressure and, therefore, a counter-force to the descending diaphragm. As long as those L ribs remain in ER, the L hemi-diaphragm will remain in a tonic state, influencing the tonicity so often seen in the L psoas. In summary, when the L hemi-diaphragm contracts unopposed by the L abdominals, our upper body mass tends to shift to the L and, therefore, force us to compensate by spending more time and placing more weight on the R lower extremity in stance or L swing phases of gait, creating and perpetuating dysynchrony! So while the R psoas can exert some degree of sagittal plane and L transverse plane motion, it serves us better in the frontal plane, creating convexity at the lumbar spine to provide fulcrum from which L thoracic abduction can occur. L thoracic abduction is a necessary movement pattern for maintenance of L ZOA and to provide the L hemi-diaphragm with a fulcrum (L hip) that is now situated directly below. With an established L ZOA through L IO/TA activation, the L hemi-diaphragm can do its job of breathing – creating pressure differentials that allow us to manage gravity and walk, efficiently – with the least amount of force and torque. This is how a R psoas indirectly enhances R apical expansion, along with many other muscles not mentioned in this orchestrated movement pattern. L IOs/TAs and a domed L hemi-diaphragm are the principle lower spinal/sacral/pelvic rotators to the L.
Finally, why is it that the L hemi-diaphragm, not the R, expands the R intercostal and apical regions? Rib position determines a hemi-diaphragm’s respiratory direction of flow. When ribs are IRd on one side, they are ERd on the other. IRd ribs assist the hemi-diaphragm with achieving and maintaining its ZOA to effectively draw air in. Therefore, sufficient activity of the IOs/TAs, via their attachments to the ribs and their influence on intra-abdominal pressure, is a requirement for that hemi-diaphragm’s ZOA. We have 117 techniques in the standing integration section to teach us to get the R side to let go and to get the L side of rib cage to IR, highlighting the importance of L IO/TA activation to establish L hemi-diaphragm ZOA and restore its respiratory role. This post really helped me understand airflow better. Thanks very much! In the second last paragraph you mention the L hemi-diaphragm with its IR'd ribs due to insufficient IO/TA avtivity, did you mean ER'd or have I misunderstood?